Can you believe it, another year almost finished! Our Purrsonal Assistant has been working hard to get all our writing, photos, etc. finished and published by the end of the year and then enter them in the Cat Writer’s Association contest categories. This has put a bit of a crimp in our regular blogging schedule but I have to admit, she has been working hard. The Friendly Fill Ins is a blog hop. 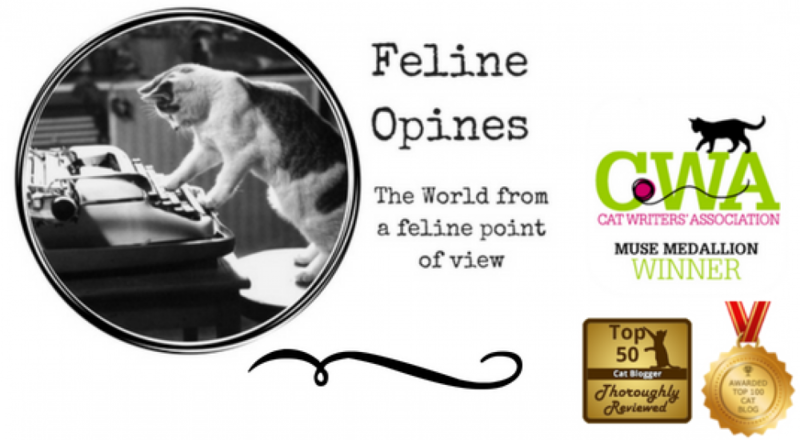 You can hop on over to the host’s sites, either 15andMeowing or Four-Legged Furballs and link to your answers or you are welcome to opine on your answers in the comments here. The Tribe of Five wish you a festive feline New Year and we are grateful for all our readers and supporters. You are all the cat’s meow! 2. A goal that I have for 2019 is ________________. 1. On New Year’s Eve, I plan to continue my normal routine of doing as little as possible. 2. A goal that I have for 2019 is to be as stealthy as I can when watching the wildlife on the upstairs deck. 3. If I had to choose a guide word for 2019, it would be cherish. 4. New beginnings can be scary but also exciting. Hello my furiends. This holiday thing has been quite hectic. As The Tribe wraps things up from this season we wish you all a Happy New Year! It’s that time again for me to share with you the fabulous feline news on the web. I hope you enjoy this week’s entries. I think our Female Human should get herself over there posthaste and bring us a first-hand report. As for me, I prefer the comfort of my house to the cramped accommodations of a cat travel carrier! This one is for all the selfish humans (you know who you are) who deprive us domesticated kitties of the joy and pleasure of a Christmas tree. Just look at our big cousins and how much fun they are having. The Tribe of Five, sadly has no tree to enjoy. Why it’s Christmas kitty abuse! Be sure and go to the link and see how much these big guys enjoy their trees. Yes, yes, I can imagine you humans scoffing right now but the good folks at the Gulf Coast Feline Foundation will turn scoffers into believers. The Jan. 26-27 event, “Felines, Football , & Fun’ will be the venue for agile kitties. You humans want to lump all cats into one purrsonality category but anyone who knows us knows that we are all very different. Just look at me and my brother Oliver…need I say more? So take your scoffing selves off to the feline agility ring at this event and let us show you what we can do. There will be lots of food, fun and an opportunity to give some felines furever homes. This Halifax kitty decided to take a cat nap in a box and ended up far away from his home when his human sealed him in a box that she was sending to a friend in Alberta. The poor human was desperate when Baloo didn’t come home the next day and she desperately searched the neighborhood for him. Imagine how happy she was when she received a call from a facility in Montreal. Baloo was well looked after by the local SPCA, who treated him like royalty, and even microchipped him for free so he can be found more easily if he takes any more impromptu vacations. So my box loving feline furiends, let Baloo’s tale be a warning….make sure you know what box you are sleeping in! Oh my whiskers! I’ve reported about many fantastic cat cafe’s but this one may just be my favorite! The Female Human has been in Stratford- upon-Avon , the place where one of her favorite writers came from. What a clever idea and how wonderful that these cat cafes embrace the culture and history of their area. You know, I might even let The Female Human put me in a travel carrier just to visit this wonderful place. I don’t know what it looks like at your house but it’s beginning to look a lot like Christmas around here. None of The Tribe of Five want to get out on the upstairs deck when The Female Human goes out to fill the bird feeder…brrr it’s cold out there. We’re staying warm and cozy by the fireplace until it warms up. I hope you enjoy this week’s web wanderings. The Tribe of Five gets to see and often try some fabulous stuff and it takes quite a bit for us to be blown away. When we saw the great gifts from Tuft + Paw (for felines and the humans who love them) we said, “Meowza!” We think you’ll enjoy purrusing their online catalog. And guess what? The good folks at Tuft + Paw are giving away two “fish” cat toys to some lucky winner. To enter, just send an email to FelineOpines@gmail.com and type “I want my cat toy” in the subject. Two winners will be drawn at random at the end of the month and we’ll notify the winners and get their address information. Dominic Pimenta, a doctor who lives in London, drove his wife to her night shift — about half an hour from their home — and on his way back, he stopped in at the supermarket for milk. When he got out of the car he heard meowing. He checked around everywhere and couldn’t find the source but still he kept hearing the meowing. Then he realized it was coming from his car. After enlisting the help of a passerby who was a nurse, they discovered Max inside the car engine. The fire brigade was called and after a complicated extrication Max was freed. And today he’s prancing around like nothing ever happened. Good grief my furiends, stay away from human’s cars! Head on Over to The Cool Cat Gallery and cast your vote for the coolest cat in Livingston Parrish. I’m rather fond of Flapjack. Seven Ways to Tell If Your Cat is Mad at You. First, allow me to say that some cats just look like they are angry. Take our Alpha Tucker for instance. He is a sweet guy but sometimes he does look a bit grumpy. Having said that,it does happen that we felines get miffed about things. I would suggest if you have a feline in residence that you read this article in order that you are able to take care of the expected apology post-haste. Might I suggest that you take a break from all the great cat photos and videos online and take some time to have a conversation with your felines? We know our names and we often respond to you when you talk to us. Jasmine addresses this issue in our new book Felines Opine on Etiquette (What Humans Need to Know About Guests, Cat Sitters and Furniture) and says that her Siamese heritage accounts for her being a very “yakky” feline. And she also says that she appreciates it when humans engage her in conversation and she never judges any human on their cat language skills. We felines just appreciate the effort humans make when they talk to us.